Jamming is exactly the right word! When humans reinvented radio jamming in the 1930s, they used all the same strategies. Mimic the original signal, stop before the original to avoid detection. I'd quibble with the statement that the jammer "modifies the fundamental". If the jam is strong enough, it would be the only thing perceived by the female, but that wouldn't change anything about the original signal. An interfering signal would have to modulate the original signal to actually change F0, which would probably require physical contact between the two males. 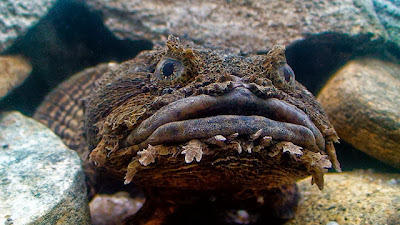 The toadfish may be no oil painting but he is better looking than the blobfish.